�Whitehouse Ruins� by Native American Navajo Mark Silversmith. This is a beautiful, gallery printed and matted special edition produced personally by Mark Silversmith. The White House Ruins is a National Monument in the Canyon De Chelly New Mexico. The Canyon de Chelly is the spiritual center for the native Navajo people. The White House Ruins were built by the Anasazi people and the name Anasazi is Navajo for "the ancient ones," who lived 2000 years ago. 20 inches x 16 inches. Framed and matted. Shipping is Free. �Twin Eagles� by Native American Navajo Mark Silversmith. This is a beautiful, gallery printed and matted special edition produced personally by Mark Silversmith. 13 inches x 27 inches. Framed in step oak walnut and matted. Shipping is Free. "Cherished One" was painted by the famous painter Marianne Millar. It is matted and wood framed. Size 25 inches x 29 inches. Shipping is Free. 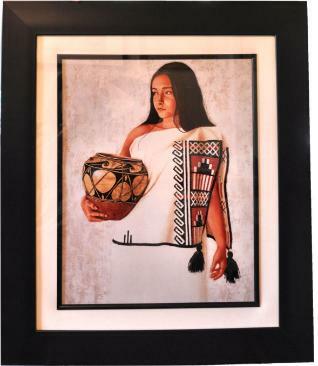 "Jeannette" is a signed fine art print by the famous Navajo artist R.C. Gorman. 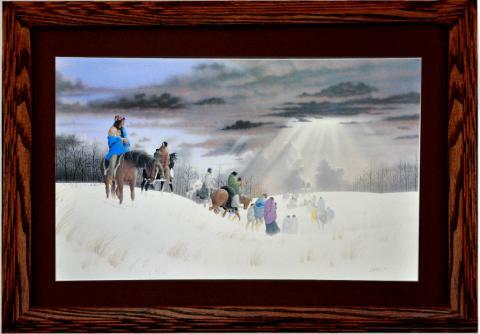 It is framed in an exquisite, ecological friendly wood with plexiglass. 32 inches x 24 inches. Shipping is Free.